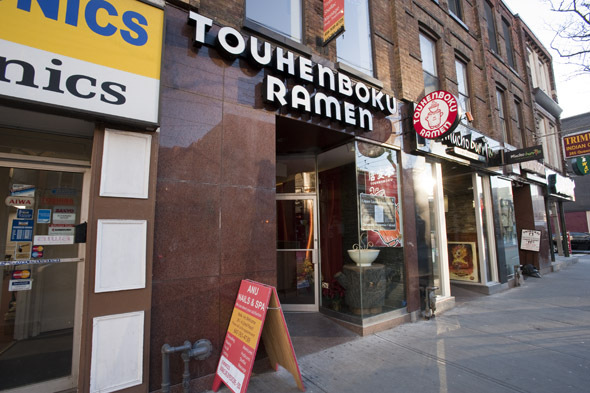 Touhenboku Ramen might look like any other ramen shop in Toronto. But look closer and you'll see a world of difference. To begin, all chopsticks, ramen spoons and porcelain bowls, which are meant to keep the ramen hot for longer, are imported from Japan - much like the restaurant's noodle master, Keiichi Machida. I'm told Machida is somewhat of a celebrity in Japan donning the covers of newspapers and magazines. Of course, much like I'd do with a first date, I Googled his name for confirmation. Sadly, nothing came up but I'll still take owner Zuimei Okuyama's word for it. After all, he is a sweetheart of a man. Walk past the open concept kitchen and you'll see a Japanese artist cranking out dough through a $40,000 noodle-making machine. 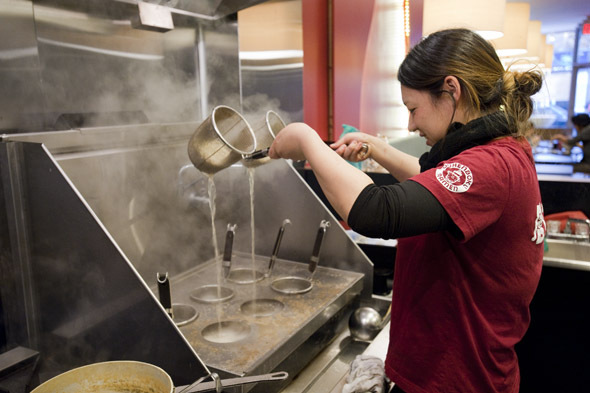 If this machine looks unfamiliar to you, it's probably because your favourite ramen shop doesn't have one. Like most places in the city, they probably order their noodles from a noodle factory in the U.S. 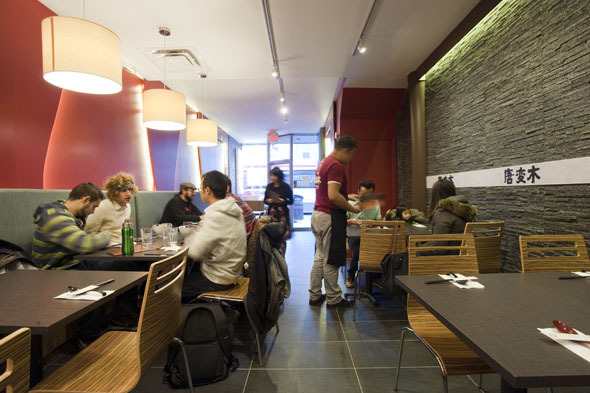 The menu is straightforward and offers three styles of ramen: white, red or black, with your choice of lean or fatty pork and sea salt or soy flavouring. But the most unique element is undoubtedly the chicken broth, which until now was unfamiliar to ramen loving Torontonians. This rich, mizutaki-style chicken broth contains less fat than the usual pork broth. As a bonus, I'm told it's also good for your skin. What more can a vein, metrosexual man ask for? We start with the "White" ramen ($10.50, lead photo) and opt for the thin noodles. 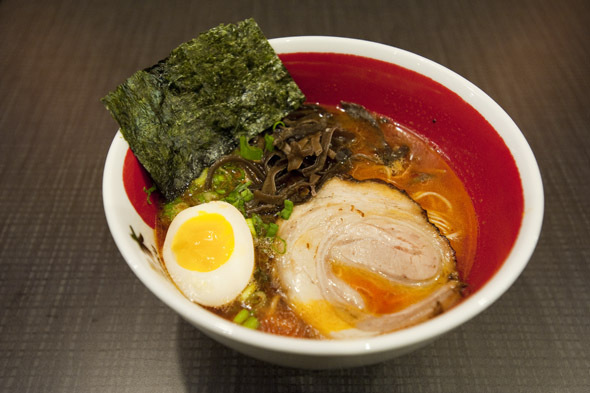 At first slurp, the broth is intensely flavoured and beyond comforting. The viscosity of the soup is the perfect balance between thick and thin. As for the homemade noodles, they're delicate with a slight chew. Next is the "Red" spicy ramen ($10.50). It may seem underwhelming upon first sip but possibly because the name is misleading - the flavours here aren't so much spicy as they are peppery, with subtle hints of smokiness. Naturally, the chef refused to disclose his "secret spices" but did mention it was a blended chili oil. Overall, the broth is much heavier than the white version but the flavours are also more complex. 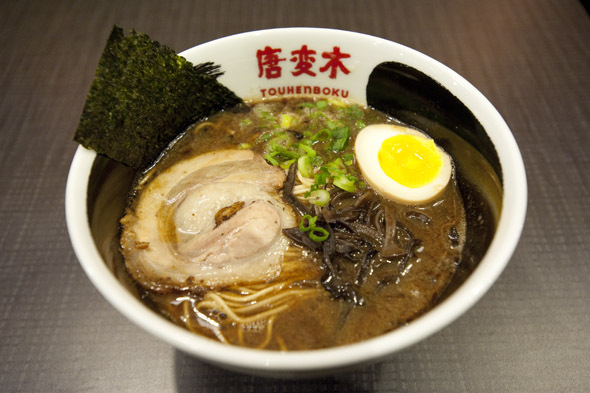 The "Black" ramen ($10.50) is an interesting addition and is apparently one of the best sellers. The broth achieves its unique colour and consistency from what seems like a boatload of infused garlic. Now I know some people love their vampire repellent, but I, on the other hand find the flavours to resemble burnt, over sautéed garlic. If there's room for dessert, skip the Japanese tiramisu and the creampuff and go directly for the Chitton Cake accompanied with crème fraiche ($5.50). This sponge cake is so light and fluffy it's like putting your fork through a cloud. 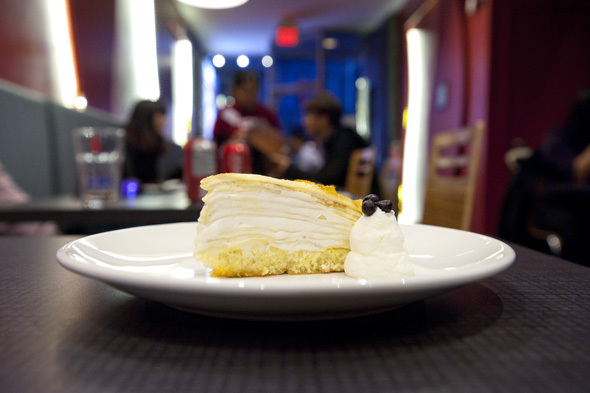 There's also the Mille Crêpes, a light dessert made from layer after layer of thin crepes and topped with a delicious custard ($5.50). It seems like the broth of most ramen places is either too salty or too bland. Touhenboku, however, falls somewhere in between in that place known as perfection. Perhaps because Okuyama is serious about the art of ramen-making. In fact, he's so serious he actually attended ramen university in his native country (yes, they have that in Japan). So sit back and enjoy a lesson in traditional ramen as Touhenboku tries to school the competition.